At the 2017 Toronto Fringe Festival, Picaza took us down a rabbit hole of contemporary dance and flamenco. It held the flamenco tradition of being sultry but elaborated into textured emotions of sadness, hope and yearning. Sofi Gudiño, artistic director of Inamorata Dance Collective, created choreography that is nuanced and wonderful, earning Picaza a nomination for Outstanding Contemporary Dance Production. I was maybe four years old, my grandfather took me to see my aunt’s performance in a flamenco show. I remember feeling an immediate sense of belonging. My grandfather lifted me on stage at the end of the show to give her flowers, and the rest is history. My background is in flamenco dance. I began my studies at the Academy of Spanish Dance as a child, and expanded into contemporary dance and physical theatre when I was in high school. While nothing ever felt as natural in my body as flamenco, contemporary dance and physical theatre allowed me to follow some of my many other inclinations and desires: to roll on the floor, to jump into the air, and to have physical contact with other dancers. I didn’t want to compromise on any of these curiosities, and so I founded Inamorata Dance Collective in 2014 to self direct various collaborative projects where I could explore the intersection of these, and many more, art forms. What was your inspiration for Picaza? Picaza is a dramatized compilation of all of my works with Inamorata over the past four years! The pieces were created as early as in my first project in 2014, and as recently as with the 2017 Fringe cast. All of my work has centred around questions of identity and belonging, and the natural story line came to the surface once we saw all of the pieces together. These topics have always been at foreground of my art because I have always had an internal dialogue about who I was or how I fit into my various communities. The thing about not fitting into one exclusive dance practice was that I was very much left to my own devices and, initially, I struggled with that a lot. Picaza came to me as an illustration of the journey to self awareness: it is never complete, but our miniature moments of “arrival” are still something to hold dear. In the review, I said the fabric you dance with moved between being a prop and a dance partner. How did you develop this relationship? One of the things I have loved about the crossover between my flamenco and contemporary dance practices is the use of props, especially the traditional costuming of flamenco and the sheer volume of fabric that is involved! In my training with the long flamenco skirts, I was taught to move and think of it as a tail, or extension of my body. This value really stayed with me- I wanted to demonstrate this intimacy with material outside of flamenco costumes. The piece was initially created with the idea that the fabric would have various importance throughout the work, and in the climax it truly took on a life of its own. When you emotionally invest in a prop on stage, the audience begins to perceive it as having its own identity. This is something I am still researching in my new projects, because I feel I have only scratched the surface of this idea! What were some of the biggest challenges you had creating Picaza? In total, we spent forty hours in rehearsal as a cast. For a full length work, that is not a lot of time! It was challenging to produce so much work with such minimal time and budget. I honestly can’t thank my whole team enough for how much they showed up for the project, people really went above and beyond their roles to bring everything together! Will you be remounting Picaza in the future? I am not currently pursuing a remount of the whole piece, but individual numbers have been submitted for various festivals. Let’s see! For me, pieces like the full corps number with the white fabric are just not done being performed. You’ve been dancing for years. What keeps you continually returning to the studio and creating work? It’s never really been an option for me not to create work or be in the studio. I think the longest I have gone without dancing was nine months when I was dealing with an injury! That’s actually how I began choreographing dance, because I had to somehow be involved in the industry while I was offstage. I can’t really describe it; when I am not dancing or creating, I don’t feel like myself. It is more than the missing endorphins from lack of exercise, it’s one of my voices. That being said, I don’t always have something to say- I can get writer’s block, I lack inspiration sometimes, I get tired and bored and struggle to consistently put myself out there in such a competitive industry where the majority of what you hear is “no”. But, truth be told, nothing has ever excited me or invigorated me the way that dance has. It’s one of my earliest languages, and I hope that I am lucky enough that it will continue to be the leading force in my life. What are your current projects? As a creator, choreographer, and a dancer. 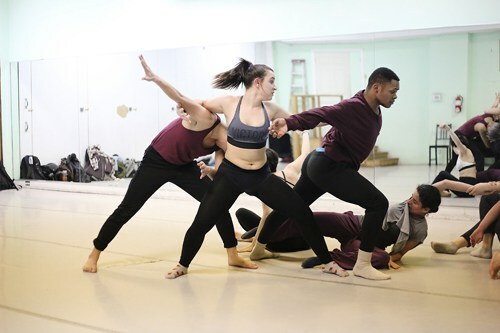 I am currently researching my next production with Inamorata Dance Collective, which began in residency at the Toronto Dance Theatre this past December. The new work is a trio with two dancers and a skirt, that explores movement inspired by the physiology of bulls outside of the matador’s ring and the idea of death as ritual. I am only in the first phase of research with this project, and it is quickly proving to be rich with possibilities and challenges. Conceptually, it is very heavy and will likely take another year in development while I unpack some of these ideas. As a dancer, I am preparing for my first trip to Spain this year to further pursue my flamenco studies. 2018 is gearing up to be a year of many new beginnings! Just that I am so grateful to my whole team for their intense efforts on and off stage. This production has been a turning point in our history and I am honoured to have it recognized with this nomination!